Four screens of Chinese paintings on rice paper or silk are peculiar to Chinese painting. 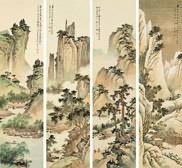 In a set of four vertical pieces of Chinese paintings at the same size, the artist paints the sense of beauty of the figures, landscapes, four seasons, birds & flowers etc, based on his knowledge and understanding on the life and nature. The paintings come from the artists' accidental lyricism, heart of the realm of few desires and insipid pursuit of moderation. 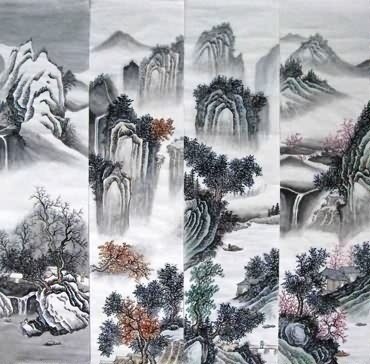 For Chinese four screens landscape paintings, the most popular theme is hand painted four seasons Chinese painting. Chinese paintings four seasons include spring, summer, autumn and winter. Chinese painters often use different colors or different plants to portray different seasons. Other themes are also applied to four screens. Many Chinese artists stress landscape and figure to exist together, or landscape and pavilion, as they thought the figure and pavilion could make the whole painting "live". Sometimes the artist will paint the four screens just based on his inspiration, but not a regular theme. After all, a good series of Chinese screen paintings should be of natural and lively artistic conception. InkDance Price: USD 1305 /GBP 1071 /EUR 1240 Sold, you can customize it. InkDance Price: USD 2809 /GBP 2304 /EUR 2669 Sold, you can customize it. InkDance Price: USD 620 /GBP 509 /EUR 589 Sold, you can customize it. InkDance Price: USD 582 /GBP 478 /EUR 553 Sold, you can customize it. InkDance Price: USD 585 /GBP 480 /EUR 556 Sold, you can customize it. InkDance Price: USD 675 /GBP 554 /EUR 642 Sold, you can customize it.